Bianca Andreescu’s incredible 10-match winning streak has come to an end after she was forced to withdraw from her Miami Open round of 16 clash against Anett Kontaveit due to a shoulder injury. The 18-year-old was trailing by two games in the second set, having lost the first 6-1, when she made it clear she couldn’t continue. An incredible 10-match win streak, which saw the 18-year-old win Indian Wells and register 5 wins over Top 20 opponents, comes to an end in the fourth round of the #MiamiOpen, as she retires down 1-6, 0-2 to Anett Kontaveit. Despite the disappointment of calling an end to her run in Miami, Andreescu can take plenty of pride in her performances over the last few weeks. The Mississauga-native will now have a chance to rest, recuperate and reflect on a period which saw her crowned the BNP Paribas Open champion after a fairy-tale run at Indian Wells, catapulting her into stardom and up to 24th in the WTA rankings. The 18-year-old Canadian, who is now ranked at 24 (!!) in the world, gets a Stadium court welcoming at the #MiamiOpen. The Canadian’s streak included five victories over top 20 opponents, including two over Angelique Kerber – her opposing finalist at Indian Wells. The youngster even managed to exact revenge on the player she suffered her last loss to, defeating Sofia Kenin 6-3, 6-3 in Miami having fallen to the American in the semi-final of the Mexico Open just a few weeks earlier. 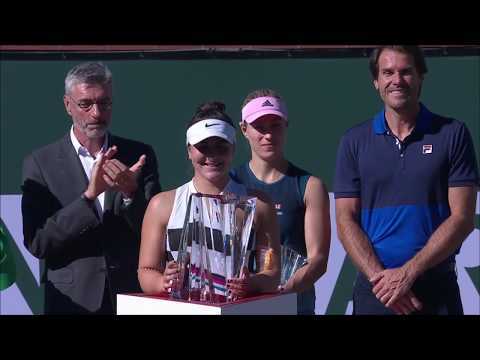 Not forgetting Andreescu’s run to the final of the ASB Classic in Auckland in January or her integral contribution to Canada’s Fed Cup win over the Netherlands in February, it’s safe to say it’s been a start to the year to remember for the teenager. We have a feeling there’s plenty more to come! Meanwhile, Denis Shapovalov beat Andrey Rublev 6-3, 7-6(5) to advance to the fourth round in the men’s singles draw. The Canadian made the first set look fairly routine as he broke the Russian early on and held his own serve without facing a break point. The second set saw Rublev go a break up in the eighth but Shapovalov responded immediately, forcing his opponent to drop his next service game to take the match to a tie break. Of the 12 points contested in the tie break, just three were won by the player serving. Fortunately, it was Shapovalov who won two of those points to seal the victory.